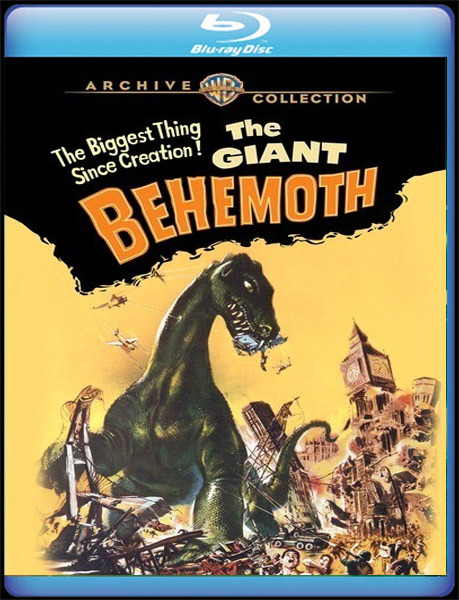 The Giant Behemoth (1958)- coming from WAC 12/19/2018?? As in his classic The Beast from 20,000 Fathoms, director Eugene Lourie plunges us into a thrilling stomping ground, unleashing another Thunder Lizard to stomp on everything in sight. Alarming levels of radiation have infused the water, plants and skies, and a radiated paleosaurus rises from the ocean depths. In its path: London. In its arsenal: a strength to topple buildings (King Kong’s Willis O’Brien contributes rampaging stop-motion effects), a stride that flattens cars, a flesh-searing radioactive ray and a ticked-off attitude. Left in ruins on land, humankind takes the fight to the beast’s undersea realm, where a two-man submarine crew must ensure the torpedo they fire is dead-on. The first chance is all anyone gets with The Giant Behemoth. Ah, another classic! Sorry, I'm feeling cynical today. Fun movie. Warner is releasing it for me. Hey, some of us love these so called "Classics!" It's great that they are finally coming out on BD. Even though the SD was a nice print. I wonder why there is nothing about this release on WBs web site? Wow they are sneaking another one in before the end of the year. WAC is on a big time roll the past few months. I have a soft spot for this film, as it was another Million Dollar Movie childhood memory. This pretty much wraps up all the Eugene Lourie sci-fi films on Blu-ray. In fact, is there a single decent remaining dino film that hasn't come out or been announced on Blu? The redundancy of this films title has always given me a chuckle. Maybe later, but the site that's link in this thread is showing a December 19th ship date which is a Wednesday not the normal Tuesday. It's probably coming out, but I'm waiting on Warner Archive confirmation as to the release date. Especially since a "small behemoth" (a stop-motion miniature figure) played the title role. WAC never even announced this title on their site either which is really bizarre ! Wow, WAC just keeps it coming. As a sci-fi/horror collector, DECENT is a relative word. In my eyes, they are all decent, some more than others. Still waiting for DINOSAURUS, THE LOST CONTINENT ('51) and the like. The December 19 release date is probably not accurate. I bet this ends up being a January title (which they haven't formally announced yet). Seriously, seriously with this announcement I even feel more spoiled, it's like going back 40 years in time and being a kid all over again and looking at that Sears big Christmas wish book and all the wonderful things that have been announced within the last week! Damn 2019 is looking really good for fans of classics. I'm generally a sucker for these types of movies but this is one lame film, imo. The Beast From 20,000 Fathoms is far, far better. Kinda like THE 7TH VOYAGE OF SINBAD and JACK THE GIANT KILLER. Exactly like that… The Giant Behemoth was for all practical purposes a remake of The Beast from 20,000 Fathoms and lifted, er… recreated, entire segments. I suspected they jumped the gun for some reason. The DVD of THE LOST CONTINENT is missing footage of Sid Melton's character smoking a cigarette after he is attacked by a Triceratops, On the plus side, it includes the scenes with Hillary Brooke and Acquanetta which were cut from TV prints. Acquanette married a Cadillac dealer in the Phoenix area. I remember seeing her in his commercials when I lived there in the late 70s. Yeah, BF20K is far better then this movie. I have a DVD and that will be good enough for me. Monsters in Motion replied – here is what he said. After reading this, there is a disconnect somewhere. Maybe the distributor meant January 19th ?? and patronage and will do our best to satisfy you. Great place to visit that Monsters in Motion. When I lived in Placentia in the O.C., I went there all the time. Go to their web site and read all about them. I met Ray Harryhausen there at one of his book signing back in 2004 and persuaded him to come to my home and see my den dedicated to his films…my avatar is the picture that was taken that day of us in my den. included with Amazon Prime membership. While "behemoth" has become a word that inherently denotes a beast of large size, its original use in the Biblical book of Job (as mentioned in the film) refers to a specific animal, probably a hippopotamus. So using the phrase "giant behemoth" in a 1950s film wouldn't be much more superfluous than saying "monstrous whale." All the same, we're surely over-analyzing the title of a B-movie, though I admit it's fun to do so. Missing 11 minutes and in the wrong aspect ratio. Yes the correct running time is 80, although the Warner DVD case lists it as 90.